It’s easy to die in Vinland. It’s also easy to get lost, in the best possible way. 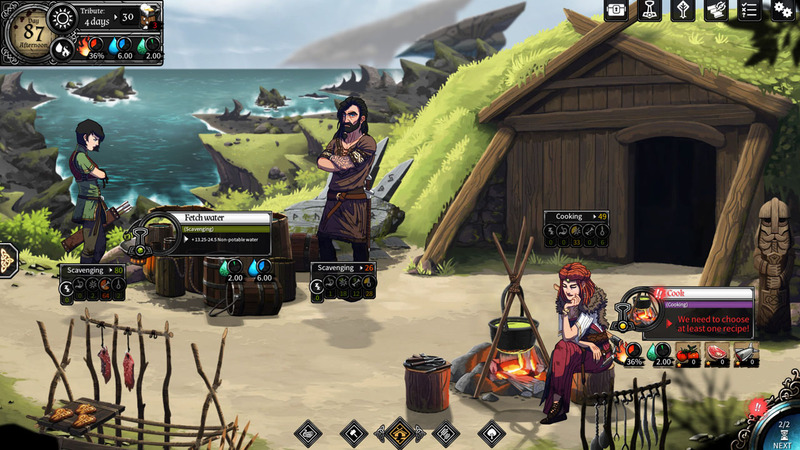 A meticulous balance of survival, resource management, adventure, and role-playing elements keeps players immersed in the story of an exiled Viking family. Though it shares similarities with Dead in Bermuda, Dead in Vinland is an artful reimagining of its predecessor’s engine, replete with stunning artwork and new characters to love. Dead in Vinland revolves around a party of characters stranded on an island that you come to realize is full of wonder and danger and magic. But, in this latest iteration, the objective isn’t to escape the island; it’s to successfully settle there. 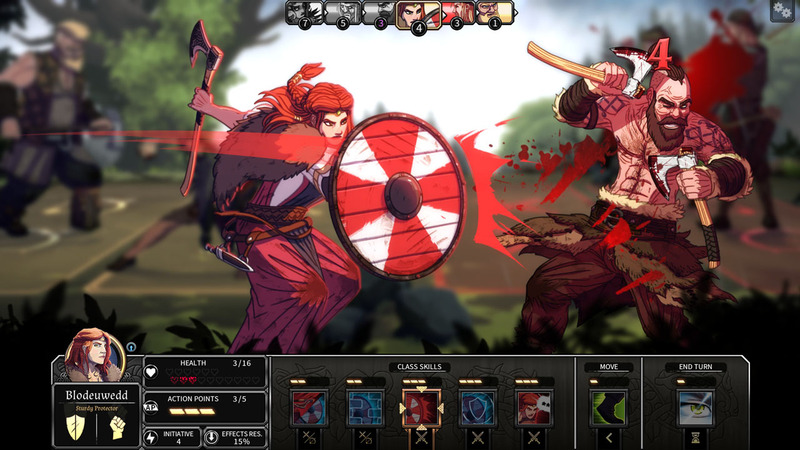 The gameplay is broken into phases of resource management, exploration, roleplay and narrative, and turn-based combat. It all centers on survival, which begins and ends with how you choose to manage the camp. You assign characters activities based on the needs of the camp as well as the characters’ own inclinations. Each has their own character sheet modeled after a classic tabletop RPG. The fact that their personalities are reflected in their skill sets is a thoughtful touch. The bold and reckless teenager has a taste for exploration, while the senile old crone has gifts for harvesting and healing. As characters level up, a spec system adds yet another layer of RP intrigue. You begin with only a shelter and a workshop, but gradually build village facilities that enable a multitude of activities. As with most survival games, there are many external challenges to contend with and take into account when trying to formulate your optimal path forward. For instance, weather has a serious impact on daily tasks, as do character interactions. 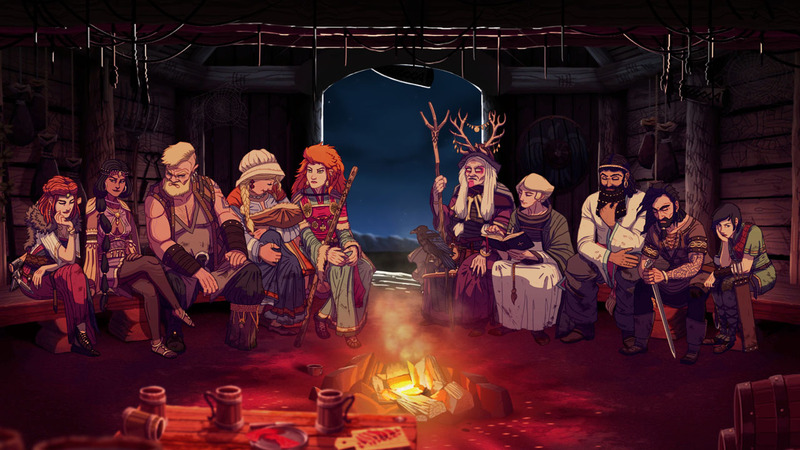 After a long day’s work, the family (and any recruited allies) sit around the fire and chat. The story comes to life during this phase of gameplay, unfolding seamlessly in relation to recent developments. Whatever events transpired during the day becomes the centerpiece for conversation. If there was nothing of consequence, characters slowly unspool their backstories or interact in humorous and sometimes meaningful ways. But what makes this game addicting is how it demands players balance a wealth of information. It’s impossible to do it perfectly, especially since new elements and obstacles are introduced at a measured pace — so long as you go exploring, which is a pretty mandatory part of moving the game forward. Through the exploration phase, small squares of the island are revealed. Each presents a challenge or mystery, and some lead to sidequests or recruitable party members. Oftentimes, you’ll run into the lackeys of the island’s kingpin and a 3v3 battle commences. Simple, methodical, and with all the trappings of turn-based combat, this phase is unfortunately one of the few drawbacks. It quickly loses its novelty and the combat becomes a mundane chore necessary to progress the exploration phase. During all of these phases, characters’ overall health can be affected. Dying in Vinland can be the result of sickness, injury, hunger, thirst, fatigue, or depression. Keeping your tribe alive depends on a player’s foresight, as well as the ability to make trade-offs. It can be a lot to keep track of, and at any given point, there is a plethora of information on screen. Miraculously, it all fits, thanks to some seriously well-considered interfaces. Dead in Vinland’s intriguing mechanics are complemented by gorgeous design. It’s like stepping into a comic, each frame carefully considered and masterfully executed. What’s especially impressive is the legibility of the game. It never feels cluttered. Despite all the stats that can appear on the screen, the game displays information in a clean, streamlined, and aesthetically-pleasing way. Even the menus can be appreciated — from the flourish of a Celtic knot to the intense detailing of an icon. The environments are works of art unto themselves, where colors and lighting glimmer with that same hint of magic that’s present in the storyline. At its best moments, the game echoes of Icelandic sagas. It’s family-centric, rife with drama and violence. At its worst, the dialogue falls flat, rings anachronistic, or is otherwise riddled with typos. To be fair, the studio that created it is French, and the sometimes-choppy text doesn’t detract from the game’s overall enjoyability.